The Buddhist god of wealth, known mainly as Vaisravana, Kubera, and Jambhala, is an important and complex figure. In addition to his role as lord of wealth and prosperity, Vaisravana acts as guardian of the northern sphere of our world and as such is usually represented in armour, mounted on a lion to show his might. Here the dispenser of wealth and treasure is represented according to the Indian Sadhanamala, an anthology of rituals which describes Jambhala as small, with a large belly, adorned with a royal diadem and jewellery, as well as a scarf and garland of lotus blossoms suspended about his body. He holds the lemon in front of his chest and a small mongoose spewing jewels on his left thigh . Although the lion mount is not prescribed for Jambhala in the Sadhanamala, it is a reminder of the assimilation of his iconography with that of Vaisravana . 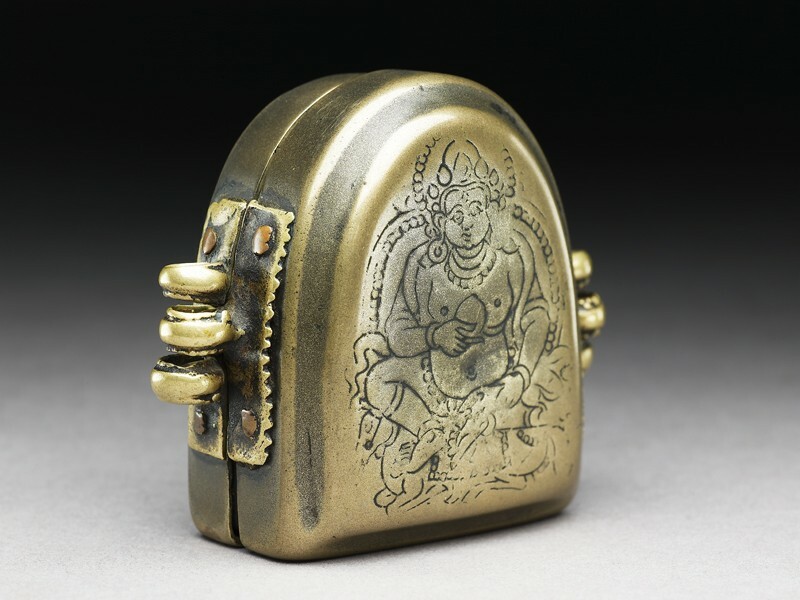 The amulet box has been crafted in what appears to be a brass alloy with high tin content, rendering the metal very white, to convey the radiance associated with Jambhala. Jambhala's very round eyes and peaceful expression correspond to his attitude as an attentive guardian of wealth. He is far from the wrathful guardian or warrior. His stout body proportions reinforce the notion of guardian of wealth, as such corpulence is the privilege of the rich. The carving is barely recessed, the image bearing a close correspondence to the representation of Jambhala in Tibetan thangka paintings of the twelfth to fourteenth century . The high chignon behind the five-leaf crown, plain disc earrings, and belt with sashes, whose edges float from his waist, all reflect Pala influence as represented in Tibetan works of art of this period. This iconography of Jambhala appears to have been popular in Tibet from c. 1100 to the early fourteenth century . Subsequently it became relatively rarer, being superseded by the yellow Vaisravana, dressed in armour and holding a banner of victory and the mongoose, sitting on the snow lion . 1 See de Mallmann, Introduction a l'iconographie du bouddhisme tantrique, p. 196, corresponding to Sadhanamala text no. 288. 2 See de Nebesky-Wojkowitz, Oracles and Demons of Tibet, p. 68. 3 See Kossak and Casey Singer, Sacred Visions, pl. 25, for the representation of Jambhala and Vaisravana as guardians in a painting attributed to second half of the thirteenth century. 4 See Reynolds et al., Catalogue of the Newark Museum Tibetan Collection, pl. S8, p. 69, for a sculpture of Jambhala in this iconography but seated on a lotus throne, attributed to Tibet, 12th-13th century, reflecting stylistic influences from Pala India. 5 See Ricca and Lo Bue, The Great Stupa of Gyantse, pls. 73-6, p. 242, for this representation of 1427 in the context of the pantheon represented at Gyantse.